There are many developments in the fashion industry that are disrupting the way that we produce, wear and talk about clothing. From the technological advances that produced the AI models of instagram to aeronautical engineering solving the waste problem surrounding baby clothes, the new generation are creating and evolving new ways of working. Aurélie Fontan, the winner of the Vivienne Westwood Sustainable & Ethical Award and many more at GFW18, is one emerging designer with a passion for innovation and creativity. Aurélie partnered with Samsung to use its Galaxy Note9 in the seven major steps of design and production to produce a ‘Mobile Couture’ collection, after being named a One to Watch by Elle Magazine. From concept to realisation, the French designer used the Galaxy Note9 to invent her new collection. This included sourcing inspiration, sketching designs, patterns and fastenings, and producing 3D printed garment fastenings. Using a digitalised process radically reduces the negative environmental impact created throughout the process of design, avoiding common traps such as waste fabric when pattern cutting and toiling. There are many benefits to using cutting edge technology, as Aurélie discovered. As the tools used are portable, it allowed Aurélie evolve her designs wherever she was. That last minute idea at midnight? It’s easy to record and implement into the process. A flash of inspiration on the tube? Noted down and implemented straight away. The Note9 sped up the prototyping process by approximately 40% and the collection was created in eight days, instead of the usual 14. It’s inspiring to see transformative ideas and technologies, along with collaborations paving the way for emerging designers to design a positive industry for the future. Congratulations to our GFW18 alumni and award winner on her fantastic new work- find out more below. 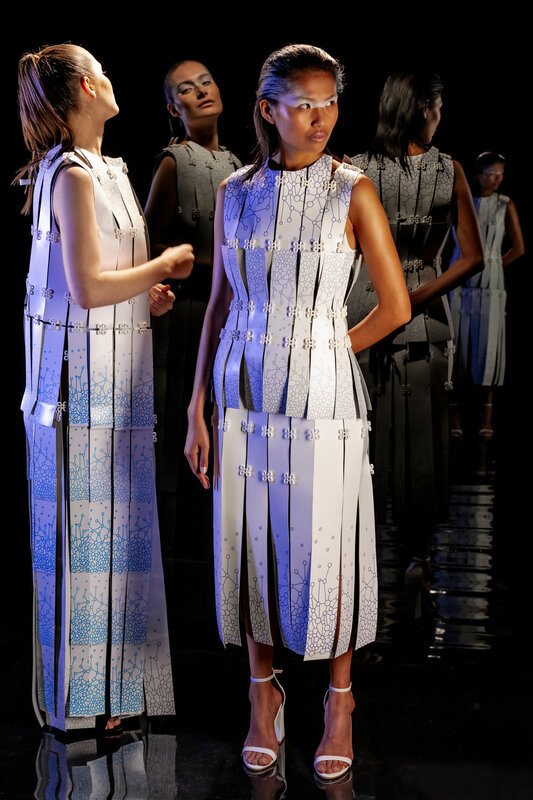 Samsung Mobile Couture X Aurélie Fontan from The Graduate Fashion Week on Vimeo.